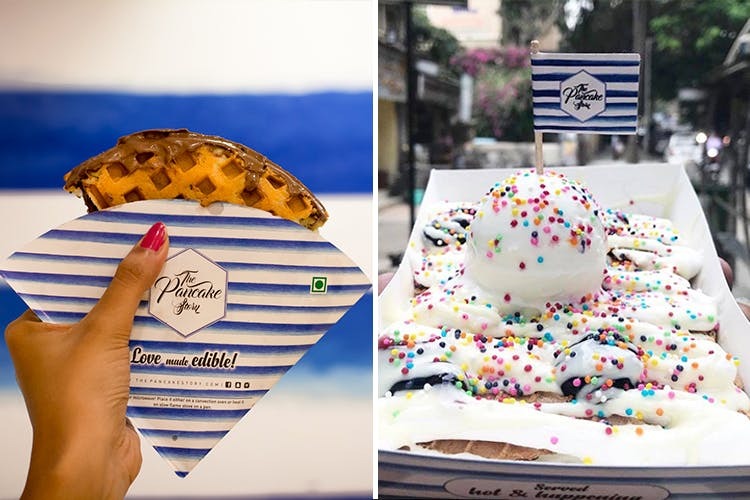 If you are a kind of person who will choose chocolate over anything, head to The Pancake Story, a new dessert parlour that has made its way to Aundh, all the way from Mumbai. A major sugar rush is inevitable at The Pancake Story. Their menu, comprising waffles, coolers and crepes, is the epitome of all things nice and sweet. We recommend you try the signature mini pancakes that they will prepare in front of you. Top your dessert plate with a religious amount of almond flakes, whipped cream, fruit compote, butterscotch syrup and caramel sauce. We also loved their Twix crepe made of dark and milk chocolate with ice cream scoops and chunks of Twix. Apart from these, The Pancake Story is known for its exclusive dessert nachos, a sweet take on the otherwise spicy snack. There are three kinds to choose from – berry n’ cream cheese, chocolate bomb and Nutella affair. We tried and loved the chocolate bomb, which was an overload of sweet nachos with banana slices, topped with brownie chunks, dark chocolate, ice cream and chocolate sprinkles. And if all this isn’t enough, get yourself a thick choco Oreo shake to end the meal. The Pancake Story is a sweet haven for all dessert lovers. Go there, today!